FullEventLogView is a simplified event viewer for Windows. 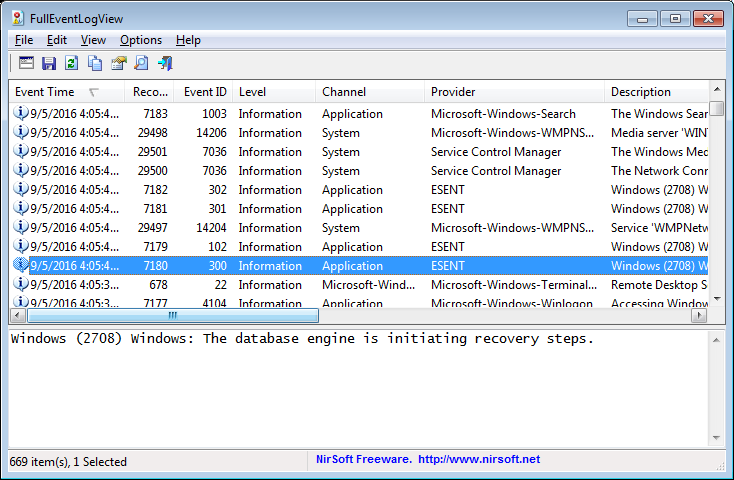 Launch the program and it displays a table listing all recent events from Windows event logs. It can also display events from a remote computer, or events listed in a .evtx file. The table displays the event time, description, provider, level (information/ error/ warning etc), channel, opcode, task, keywords, process ID, thread ID, computer, user and more. Clicking any column header sorts the table by that field. You could use these to organise the table by time, for instance, or to group particularly important events (errors, warnings) together. As usual with NirSoft apps, all or selected events may be exported to TXT, CSV or XML files, or as an HTML report. Fixed bug: FullEventLogView failed to display the event strings in the lower pane ('Show Event Data + Description' mode) and in the columns ('Show Event Strings In Columns' option). FullEventLogView doesn't have the power of the standard Windows event viewer, but it's easier to use, and may still be able to help you diagnose all kinds of odd PC issues.